An easement is a right to use another person’s land for a specific purpose. A right of way easement gives the right to cross over another owner’s land, typically to access to a public road. Utility easements for water pipes, sewer pipes, and electric lines give utility companies the right to access land for installation, maintenance, repairs and upgrades to services. An easement may benefit a specific person or persons, or it may benefit a particular piece of land. Express easements are created through a deed or other document that describes the use. The scope of an express easement is determined by terms of the document creating the easement. An easement affecting real property typically transfers with the property when it is sold. The document creating an easement should be recorded with the recorder for the county where the property is located to give future buyers notice of the easement. An easement by necessity arises by operation of law when (1) there is a strict necessity for a right-of-way, such as when the claimant’s property is landlocked and (2) the landlocked property and the adjacent property with street access were originally owned by one person. A prescriptive easement may arise when a person uses another’s person’s property and the use is notorious, adverse, continuous and uninterrupted for at least five years. “Adverse use” means that the owner has not expressly consented to the use. “Continuous use” means use that is as frequent as appropriate given the nature of the use and the character of the land. In Aaron v. Dunham (2006) 137 Cal.App.4th 1244 a private road was built that went from a public street across two adjoining parcels to a third property. For many years owners of the middle parcel used the road across the adjoining parcel to access the street without the adjoining owners’ permission. The street parcel owners informed the middle parcel owners that they could no longer use the road across the street parcel, and the middle parcel owners sued to establish an easement. The appellate court held that the owners of the middle parcel held a prescriptive easement giving them the right to use the road on the street parcel to access the street because prior owners of the middle lot had previously used the road for street access without the adjoining owners’ permission for more than five years. An owner can prevent a prescriptive easement by periodically interrupting the adverse use, or by posting at each entrance to the property or at intervals of not more than 200 feet along the boundary, a sign substantially reading: “Right to pass by permission, and subject to control, of owner: Section 1008, Civil Code.” Aaron v. Dunham holds that signs with the language required by Section 1008 will not prevent a prescriptive easement if they are posted by someone other than property owner or the owner’s authorized agent. Maintaining the Easement. Let’s assume that multiple landowners agree to establish right of way easements over their properties giving each access to a public street. Who pays the cost of building the private road and maintaining the road after it is built? It is a good idea for the owners to agree on cost allocations when they agree to the easement, and to include a road maintenance agreement with the recorded easement in order to avoid future disputes over the costs of maintaining or repairing the road. Civil Code section 845 addresses the allocation of maintenance costs among easement owners. Section 845(a) provides that the owner of a private right-of-way easement or the land attached to the easement shall maintain it in repair. Section 845(b) provides that in the absence of an agreement, the cost of maintaining or repairing the easement “shall be shared proportionately to the use made of the easement by each owner.” A property owner is only required to contribute to the maintenance of the segment of the right of way lying between his or her driveway and the public road. Healy v. Onstatt (1987) 192 Cal.App.3d 614. It may also be proper to adjust maintenance costs between vacant parcels and parcels with occupied residences to reflect each owner’s actual use of the easement. Id. Civil Code Section 845(c) describes remedies that are available if an owner refuses to pay his or her proportionate share of easement maintenance or repair costs. In 1864 the California Supreme Court invoked the agreed-boundary doctrine to resolve a lot line dispute between adjoining landowners. In 1847 L.W. Boggs and G.W. Harrison each acquired adjoining one square mile tracts of land from Salvador Vallejo, but the descriptions of each parcel in the two grant deeds were ambiguous. Harrison later sold three smaller adjoining parcels in his tract to others. In 1854 the purchaser of a ten acre tract built a fence around the perimeter of what he believed was the boundary of his land. Later surveys determined that that the actual boundaries of the ten acre parcel were significantly different from the boundaries shown on earlier surveys, and litigation ensued. In Wiley Sneed v. J.W. Osborn (1864) 25 Cal. 619 the Supreme Court held “when the owners of adjoining lands have acquiesced for a considerable time in the location of a division line between their lands, although it may not be the true line according to the calls of their deeds, they are thereafter precluded from saying it is not the true line.” In Wiley Sneed, the Court invoked the agreed-boundary doctrine in deciding that the fence around Sneed’s land established the parcel’s boundaries because the legal descriptions of Sneed’s and the adjoining parcels were ambiguous, and the other owners waited too long before taking steps necessary to establish their actual property boundaries. The agreed-boundary doctrine has fallen into disfavor, as overtime land surveys have established accurate property boundaries throughout California. In Bryant v. Blevins (1994) 9 Cal.4th 97 the California Supreme Court held that where property boundaries are established by publicly recorded surveys, an owner may not alter the dimensions of his land merely by building a fence on his neighbor’s land. The Court notes that the agreed-boundary doctrine “encourages a lack of due diligence on the part of property owners by tempting them not to consult legal descriptions in an effort to reach an amicable resolution of their disputes, and instead induces property owners to resort to the courts to resolve their boundary disputes”. Publicly recorded land surveys have not eliminated all boundary disputes, however, and courts now invoke the “relative hardship doctrine” to resolve similar boundary disputes between adjoining landowners. California courts apply the relative hardship doctrine to fashion appropriate remedies where an owner builds a structure that encroaches on another’s land. Once the court determines that a trespass has occurred, it conducts an equitable balancing to determine whether to grant an injunction prohibiting the trespass, or whether to award damages. Under the relative hardship doctrine, the courts consider three factors: (1) whether the encroachment was placed innocently; (2) whether the encroaching neighbor would suffer significant injury if forced to move the encroachment; and (3) whether the hardship caused by ordering removal of the encroachment would be disproportionately greater than the hardship on the neighbor that would result if the encroachment is allowed to remain. The trial court first identifies the competing equities underlying each party’s position. It then balances the relative hardships of granting or denying an injunction to remove encroachments from the plaintiff’s property. If the encroachment is extremely difficult or costly to remove and is causing little inconvenience to the adjacent property owner, a court may allow the encroachment to remain and instead award the adjacent landowner monetary damages for the loss of use of the property due to the encroachment. The application of the relative hardship doctrine is demonstrated in Hirshfield v. Schwartz (2001) 91 Cal App 4th 749. The Hirshfields and the Schwartzes owned adjoining lots in Bel Air, but they were uncertain about the exact boundary line between the two lots. Over the course of 20 years, the Schwartzes built a concrete block wall, waterfalls, a stone deck, a Koi pond, and a putting green on what they thought was their land. In 1997 the Hirshfields determined that a portion of the improvements had been built on 800 feet of their property. The Hirshfields sued for quiet title and trespass and sought an injunction to compel the Schwartzes to remove the encroaching structures. The trial court concluded that the Schwartzes innocently believed that the improvements did not encroach on the Hirschfield’s property when they were built and that the hardship of forcing the Schwartzes to remove the improvements significantly outweighed the hardships the Hirschfields would face if the encroaching improvements remained. The court held that the encroaching improvements could remain until the Schwartzes either moved or sold their residence and ordered the Schwartzes to pay the Hirschfields $23,000 for the fair market value of the 800 square feet of their land occupied by the Schwartzes’ encroachments. The appellate court upheld the trial court’s decision but clarified that the Schwartzes’ qualified right to use a portion of the Hirshfield’s land was not an equitable easement. 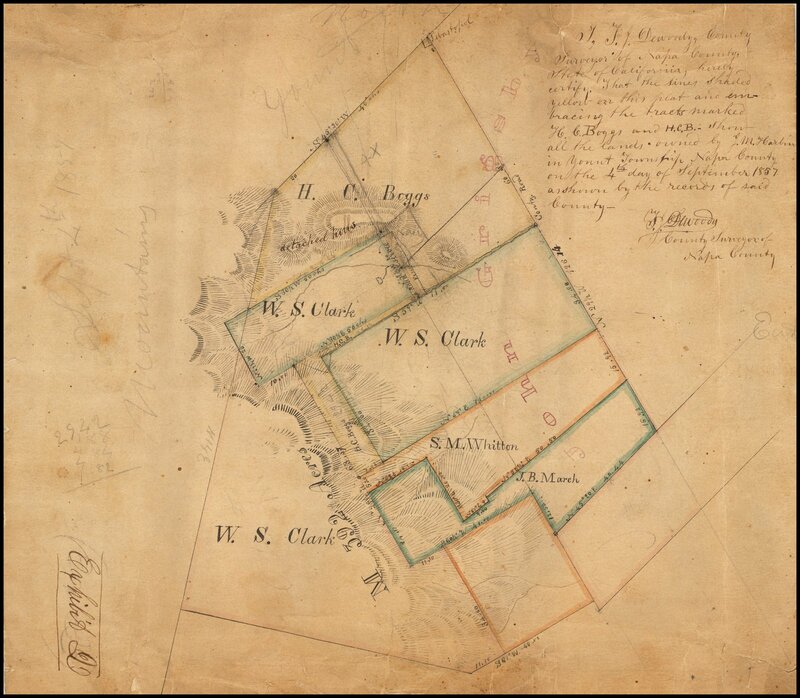 Survey of Yountville, Napa County, drawn by T.J. DeWoody, identifying lands owned by James M. Harbin as of September 4, 1857. T.J. DeWoody served as Napa County Surveyor in the 1850s and 1860s. The map was likely used as an Exhibit in a Land Grant court case involving Harbin. Salvador Vallejo received a land grant from the Mexican government in the 1830s. Vallejo called his lands “Rancho de Napa” in what later became Napa County. Salvador Vallejo began selling his lands to American settlers after the Bear Flag revolt in 1847 during the Mexican-American war. California became a United States territory in 1848 under the treaty that ended the Mexican-American war.